”And, lo, the angel of the Lord came upon them, and the glory of the Lord shone round about them: and they were sore afraid” (Luke 2: 9; see the gospel text for this story). 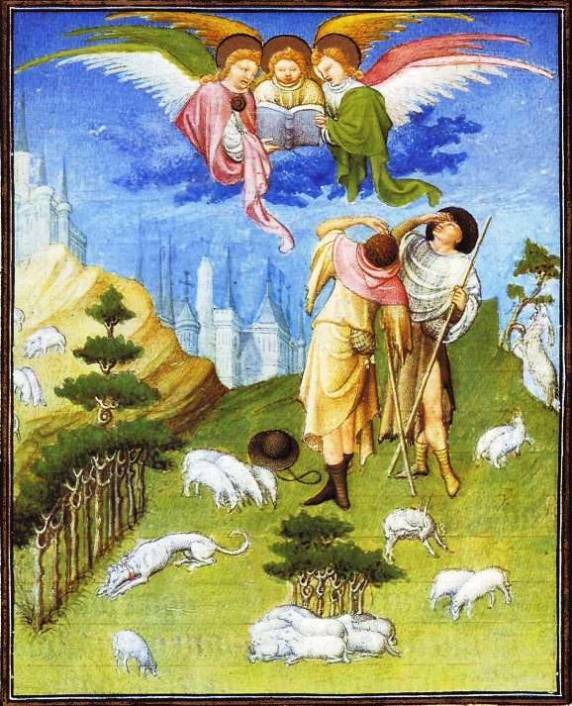 The Annunciation to the Shepherds was commonly represented as a separate scene only in the fourteenth century, and it then assumed a place in French Books of Hours. It became popular because it gave prominence to simple people who might otherwise have been overlooked: the theme of the Adoration of the Magi had concentrated heavily on the nobility. According to the Duke’s version of the Meditations the shepherds looked up to see three suns that afterwards merged into one (the Trinity), and here the two herdsmen shade their eyes to watch three angels with golden haloes announcing the birth of the Messiah and singing the Gloria from their open book. The angels, resting on a puffy mass of blue clouds, are linked to each other, to the book they hold, and to the shepherds. Green draperies and rose wings alternate with green wings and a rose cloak that is echoed in the rose hood of the shepherd below, dressed in the same buff as the center angel. The second shepherd wears a rough tunic of skin with a cape that seems to be made from the wool of the flock he has been guarding. The hungry goat stretching to reach a higher branch in a tree has a long history in art – think of paintings of Moses finding a ram caught in the thicket. But the animal in this painting, scratching his head with a hind leg, is a lively detail added by the painter from fresh observation of nature. A long lean whippet with a red collar, reclining but with ears pricked, looks as if he has wandered in from the aristocratic world to serve as a watch dog. Could it have been a favorite dog belonging to the Duke? As usual the artist, following Florentine precedent, took care to maintain a balance at both sides of a central axis. It is marked here by the middle angel; slightly to the left lies the shepherd’s hat, whereas the shepherds themselves stand at the right. Toward the left, however, the city of Jerusalem appears at the horizon and, nearer the frame, there is a golden hill illuminated from above and crowned by the towers of Bethlehem.